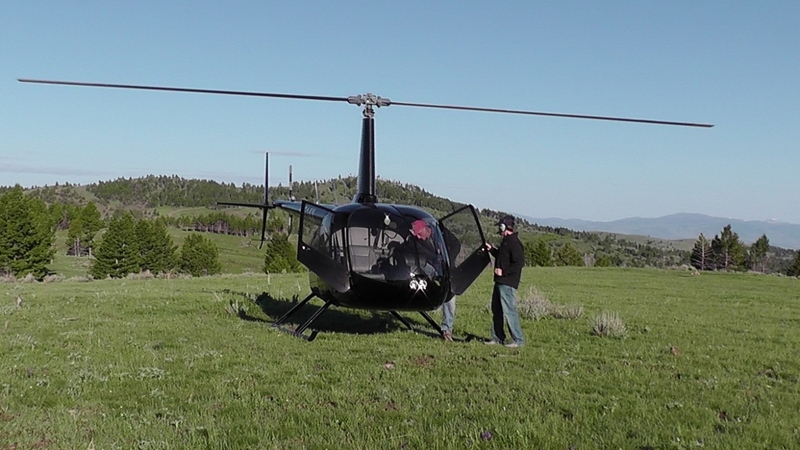 We offer the most exclusive Bison and Wildlife Adventure anywhere! Okay, time for another “I Love My Life” segment. I’ve had a blast these last couple of weeks looking for sage grouse leks on the Crow Reservation (Apsaalooke Nation) with some really fun people. And it’s hard for me to look for anything wildlife without trying to do my amateur best to catch it on film. I don’t have great equipment, but it’s good enough to balance on the edge of my car door and capture some of the awe inspiring wildlife behavior that I see in the world around me (and since youtube has that “we can fix your shakiness”, the grouse aren’t shaking around too much – just the words :)!. And since we’re looking for (and finding) Greater Sage Grouse leks, that’s what I was able to film (thanks to the patience of the fellas I was with – one of which gave me this great quote that I used for the title). A few years ago, Craig made a squirrel house and put it on the Doug Fir tree in the front yard (just a few feet from our front porch). While a squirrel used it one winter, it never did house squirrel babies. 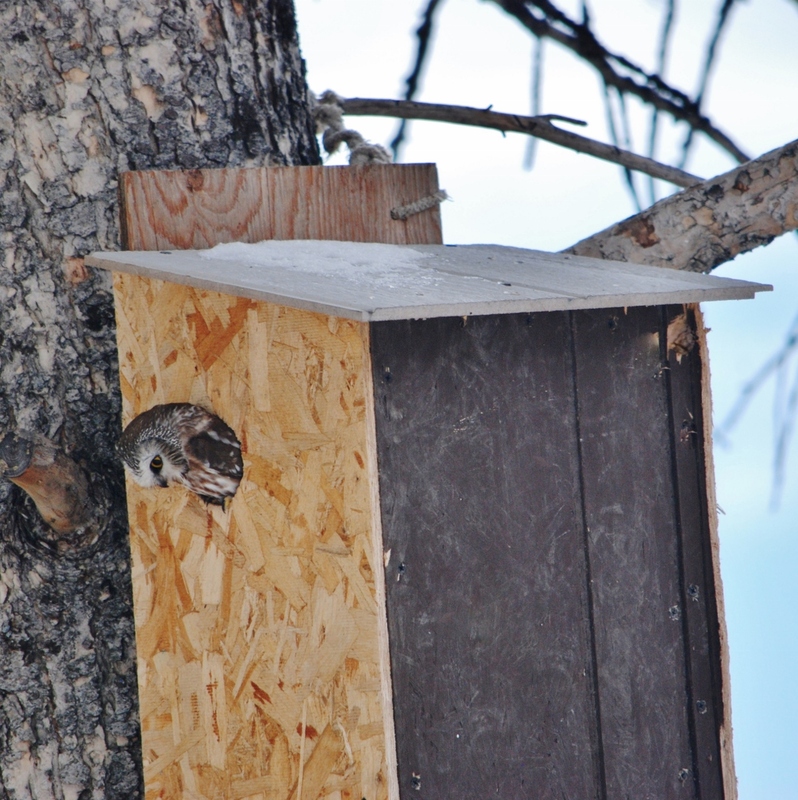 Then, the other day as we wandered out in the early morning to get in the truck to go feed the buffs, Craig said, “Well, look at that!” And peeking out of the “squirrel” box was a wee owl face watching us with the utmost concentration. We had heard Northern Saw whet owls calling (a very monotonous beep beep beep beep beep beep beep beep beep that they can keep up for hours!!!) and, while we’ve never seen two at the same time, we’re quite certain that there are two and that they are nesting. I took this photo the other day as the little owl sat in the entrance and watched the chickens with interest but no real intent (the chickens are about 10 times larger than this little robin sized owl who mostly eats mice). To help out a little, we’ve been scattering some bird seed on the ground around the tree at night. Now that’s what I call a Montana mouse trap! 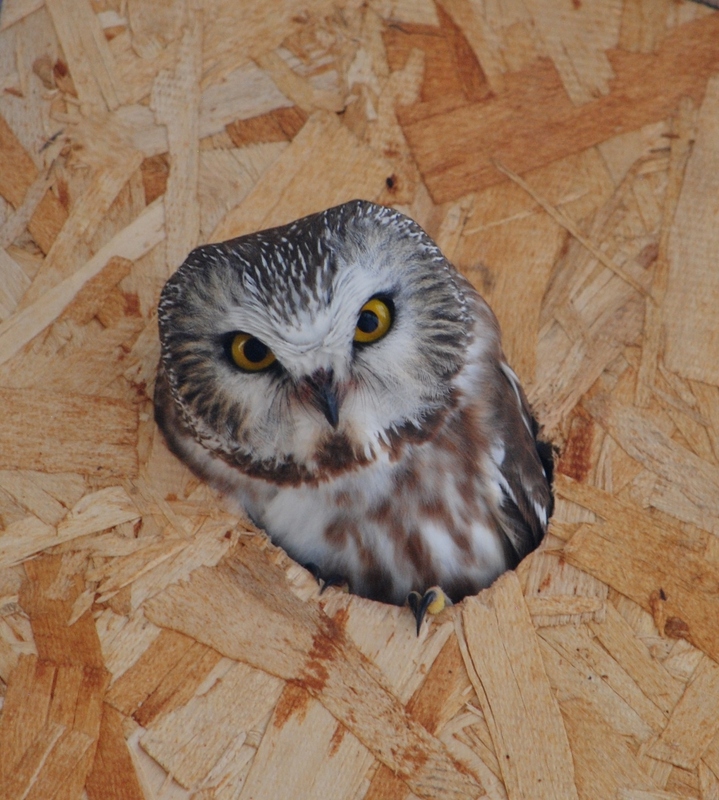 Saw whet owl watching us watching it! 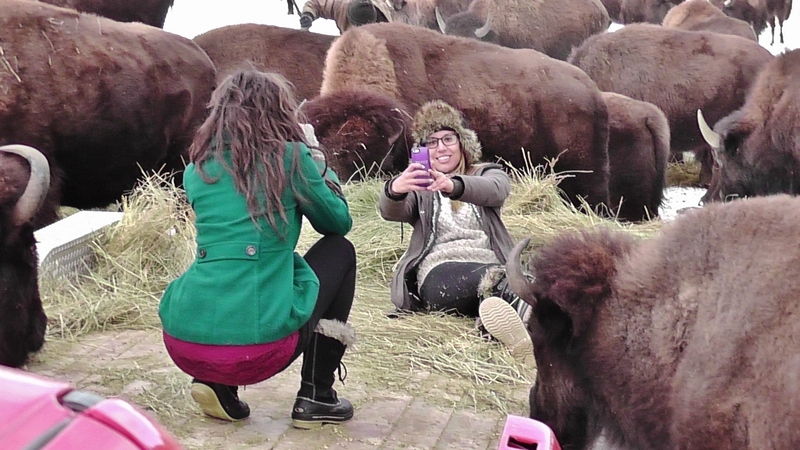 We were flattered to find that Jo Piazza (Yahoo Travel) wanted to visit us here at Bison Quest, even though it’s winter, it’s cold, and it’s snowy. But she and Jackie Laulainen (travel blogger) came for a visit anyway – and we had a blast. Of course, the buffs are all photogenic and were happy to pose for the gals to take as many pics as they wished. Watching (and photographing) Jo and Jackie taking selfies was priceless. See you gals in June! Jo and Jackie and bison – what a combination! What the…..? We only have one buff that will let you smell her :)!! So smell they did. Commuting to work Monday morning. Get up in the morning, grab a bite to eat, and run out to the pasture to catch a helicopter to work. We’re doing Golden Eagle surveys this week :)!